HLA Fleet Services, a subsidiary of Autobank AG, is implementing TecRMI’s system for calculating the costs of packages to cover maintenance and wear and tear costs on the basis of manufacturers’ data in both Germany and Austria. “Thanks to TecCOO, we have a reliable calculation for the costs we can expect for maintenance and wear and tear for different vehicle models and a solid basis for setting up flat rate packages to cover maintenance and wear and tear. The crucial factor in this is the quality of the database,” says Matthias Rotzek, Managing Director of HLA Fleet Services of the company’s decision. Markus Diesch (Sales Manager Fleet & Leasing for TecAlliance, on the right) is pleased that the quality of TecRMI’s data has won over Matthias Rotzek (Managing Director of HLA Fleet services, on the left) and Roland Bauer (Manager of Technical Services, HLA Fleet Services, centre). 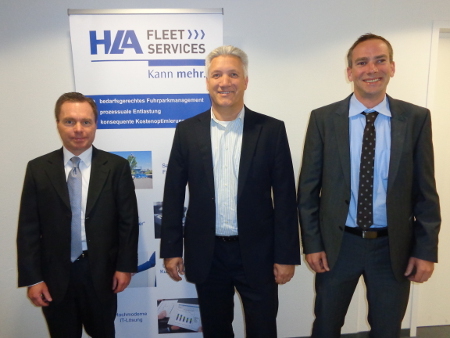 HLA Fleet Services GmbH is an independent service provider of management and services for vehicle fleets. The range of service options available ranges from consolidating structures for heterogeneous multi-supplier vehicle fleets to individual options such as the management of servicing, repairs, tyres and fuel payment cards right through to individual client services. These services can be provided for cars, lorries and industrial trucks. With its team of company representatives and automotive technicians, clearly defined processes and cutting-edge software for vehicle fleet management, HLA Fleet Services achieves significant savings for its clients. TecCOO is a system for calculating the cost of maintenance and wear and tear to be expected over the life of a vehicle. Using up-to-date OE data with individual adjustments based on HLA Fleet Services’ knowledge of the sector, flat-rate packages to cover maintenance and wear and tear can be calculated for individual clients. Calculating rates this precisely benefits not only the clients but also the HLA Fleet Services company, as it reduces the administrative costs.